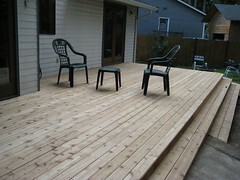 A follow-up on the previous post, where Dad, Jimbo and I built a new deck. After a couple days of rain and some crap falling out of the trees, we realized that the spacing of the deck boards was a little too close. In some places the gap had basicly closed and the boards were touching. But the bigger problem is the crap that falls out of our cedar trees and firs. it was already getting stuck in the cracks, and basicly becomes impossible to get out. 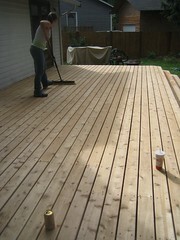 So this weeend, Laura and i redid all the decking. well, not all, because the first board stayed where it was, and one board about 2/3 way we didn’t move at all. 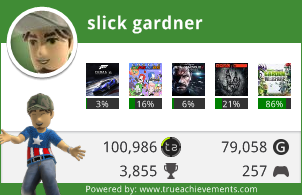 You can’t really tell much from those, but its much better!